The machine would not power up. There is a 48 VDC power supply mounted inside the cabinet (you have to remove the bottom of the pinball machine to gain access to it). The 48 volts was working. On the Spike MPU/Sound board (which is in the backbox), there are 4 LEDs to indicate the status of +48V, +24V, +8V, and +5V. In this case the 5V LED was not lit. I found that D12 was shorted. Once D12 was removed from the board, I checked that D12 was truly shorted and it was. I also checked the pads where D12 was located, and it was still shorted there as well. This meant that the A8498 regulator chip (U30) was also bad. Once both components were replaced, I bench tested the board and all of the power status LEDs came on. The following is a more detailed look at the power section for other repair people who have the expertise to repair surface mount boards.This only covers the power sections and not any other functions such as sound, the microprocessor, or the interface circuitry. The 48 volts from the cabinet feeds the 24 volt, 8 volt, and the 5 volt regulator sections. Each of the regulator sections utilize an Allegro A8498 chip, which is a 3 amp switching step down regulator. 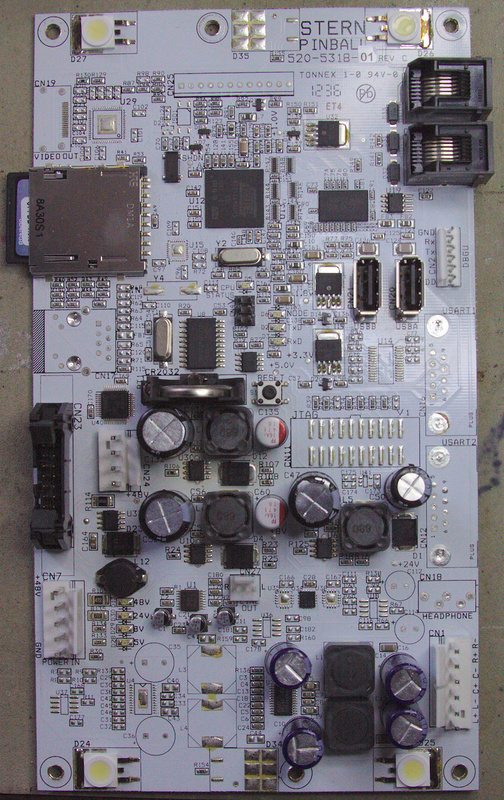 The enable pin (pin 2) for the 24 volt and the 8 volt sections are connected elsewhere on the board. If the enable pin is not 0 volts, the regulator will be disabled (turned off). The enable pin for the 5 volt section appears to be grounded so that it’s always enabled. Each regulator section consists of the A8498 (Allegro A8498SLJTR-T), a 68uH inductor, a 60V, 5 amp Schottky diode (Comchip CDBC560-G), and some input and output filtering capacitors (470uF at various voltages). Near each regulator is a test pad where the voltage can be checked. The 5 volt test pad is near the reset button. Note that the A8498 has a thermal pad underneath the chip which is soldered to the board. Only a hot air rework station will remove this chip. Each regulator section consists of the following components. Refer to the A8498 data sheet for details on how things are connected together. 5 volt section: U30, D12, L8, C132, C135, C133, C134, R106, R107, R108. The output of the 5 volt regulator goes on to power three other regulators: 3.3V (U9), 1.8V (U31) and 1.0V (U32). These regulators are Rohm BD18KA5W, BD18KA5W and BD10KA5W respectively. There are no LED status indicators associated with these regulators, however there are test pads near each one to check voltages.